Editor’s note: Christopher Preble (@capreble) is vice president for defense and foreign policy studies, and Malou Innocent (@malouinnocent) is a foreign policy analyst, at the Cato Institute. The views expressed are their own. In the wake of violent protests in Egypt, Libya, and elsewhere, as embassies and consulates scramble to beef up security, the focus here in the United States has shifted to the U.S. presidential campaign. As the candidates trade shots over apology tours and ham-fisted reactions, their partisan bickering obscures an uglier truth: both of the major parties have supported policies that have failed to deliver tangible benefits to the American people and made the United States look weak. Whether it is economic assistance to authoritarian allies, or wars of liberation and nation-building, the most powerful country in the world conveys the impression of begging for cooperation from nations of marginal importance. Democratic and Republican administrations alike have pursued such misguided policies. It’s time to stop, and the appalling response to a low-budget film mocking the Prophet Mohammad should prompt such a change. 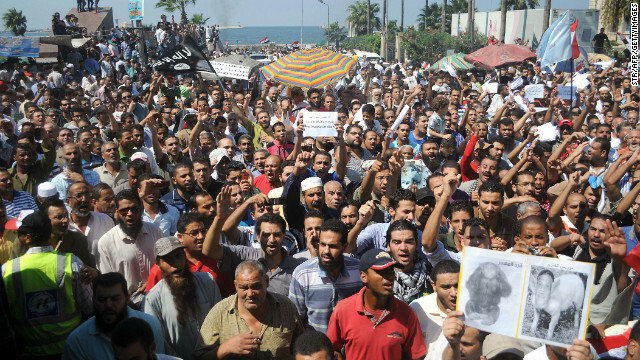 Protesters shout slogans during a demonstration outside the U.S. Embassy in Tunisia on Wednesday. Watch "Fareed Zakaria GPS" Sunday at 10 a.m. and 1 p.m. ET. The images of the American embassy burning in Benghazi might have conjured up memories of Tehran in 1979 but the analogy is false. In Libya, the government is not fomenting Anti-Americanism, it is fighting it, openly declaring America an ally and friend. The country is pro-American by a 2-to-1 margin, and the violence there appears to have been the work of small, extremist elements that lack much popular support. But the storm has spread from Libya. Palestinian men in Gaza City burn the U.S. flag Wednesday to protest an anti-Islam video. Editor’s note: Zeynep Tufekci is assistant professor at the School of Information at the University of North Carolina, and she is a visiting scholar at Princeton's Center for Information Technology Policy at the Woodrow Wilson School. She blogs at technosociology.org and can be found on Twitter @techsoc. The views expressed are her own. The recent protests over a crude and offensive anti-Islam video serve as a lesson about cultural clash in the Internet era — not necessarily between extremists on both sides, but rather between cultural understandings of free speech and the public sphere. It used to be that you needed to travel someplace new to experience culture clash. But by creating immediate connections between people, the Internet can create a culture clash without anyone leaving their couch. The chasm I’m most worried about is not the one among the makers of the film and those who might have reacted to it with violence. In fact, one may argue that the hate-mongers who made this video and those who use the provocation as a pretext to kill are in a symbiotic, mutually reinforcing relationship. The gap I’m most concerned about is the one between the vast majority of people in the Middle East and North Africa who watched the violence in Libya with horror and disgust and yet still find the existence of the video troubling and disturbing, and everyday Americans who see the story as just a few marginal, hateful people putting this video on YouTube. To understand why this particular narrative of free speech is deeply unsatisfying to many people in the Middle East, you have to keep in mind significant historical differences between the rest of the world and the United States. America’s free-speech culture and its legal framework are unique in the world — and genuinely baffling to many. 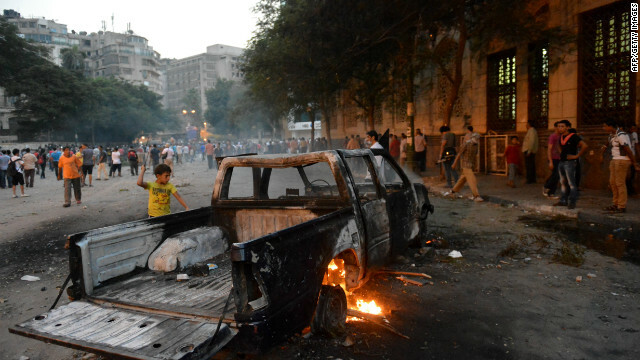 The scene near the U.S. Embassy in Cairo on Thursday. As outrage over a video that characterizes the Prophet Mohammed as a womanizing buffoon spread across Muslim countries, details emerged about the killings of a U.S. ambassador and three others this week at the U.S. consulate in Benghazi. Editor's note: Daniel Kurtzer is the S. Daniel Abraham Professor of Middle East policy studies at Princeton University’s Woodrow Wilson School of Public and International Affairs. During a 29-year career in diplomacy, he served as the U.S. ambassador to Egypt and to Israel. The views expressed are his own. Some years ago, while on a trans-Atlantic flight, I was reading a thriller novel when I came across a stunning passage: the American ambassador in Cairo was assassinated by the villains in the novel. What was so disconcerting personally was that I was the American ambassador at that time! The novel got me thinking about the day after such an assassination: that is, the reactions of family, friends, colleagues and American government. Surely, there would be favorable obituaries and fond remembrances. There would be outrage over the murder and calls for bringing the perpetrators to justice. Over time, the personal sense of loss among family members would linger, while the professional friends would naturally move on. Editor's note: Diana Eltahawy is Amnesty International’s Libya researcher. The views expressed are her own. Two years ago, when Asma Sariba wrote articles for Libyan opposition websites based abroad, she put herself and her family at great risk. Back then, she did not shy away from using her real name, even posting her picture. Today, she is one of the 33 women serving on the 200-member General National Congress after Libya’s historic national elections on July 7, which followed four decades of repression under Moammar -Gadhafi. Asma Sariba realizes that a great deal of responsibility lies on the shoulders of the Congress, which inherited a country struggling to break the legacy of systematic human rights violations and a population severely damaged by eight months of armed conflict. Christopher S. Chivvis is a senior political scientist at the nonprofit, nonpartisan RAND Corporation and teaches at the Johns Hopkins, School of Advanced International Studies. The views expressed are his own. A year since Tripoli fell to NATO-backed Libyan rebels, progress in achieving lasting security remains elusive and could even be faltering. Recent attacks suggest that Libya’s stability – and one of the Obama Administration’s biggest foreign policy successes – could be in danger. The countries that helped topple Moammar Gadhafi a year ago have a special obligation to ensure the new Libyan government gets all the help it needs to respond to these new threats effectively. 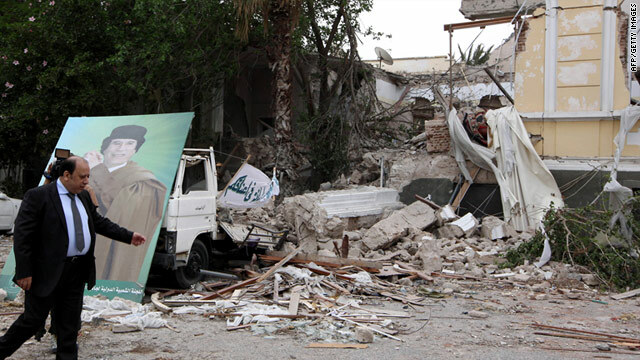 Gadhafi’s death last October marked the end of the war and the beginning of a new age for Libya. But progress on all fronts since then has been slow and hard-won. 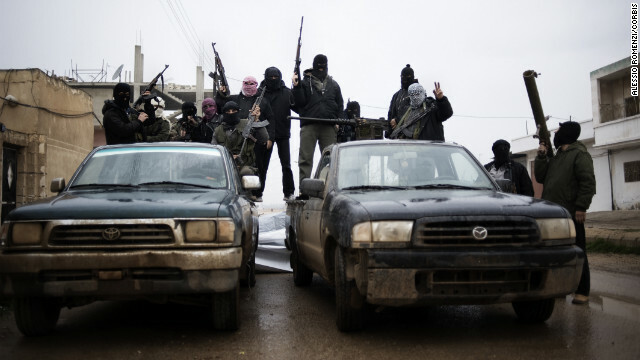 While Libya held successful national elections last month, a recent spate of terrorist-style attacks in Benghazi and Tripoli indicate the Libyans are not out of the woods yet. Is Manaf Tlas the man for Syria? Daniel R. DePetris is the senior associate editor of the Journal on Terrorism and Security Analysis. The views expressed are his own. With insurgents from the Free Syrian Army making inroads into areas that were once regarded firm bases of regime support, states backing the rebellion against Syrian President Bashar al-Assad appear to be accelerating efforts to forge an alternative leadership with the potential to take over once the uprising is done. This task has taken on even greater urgency as more Syrian diplomats defect from the al-Assad regime, and as the Syrian National Council struggles to figure out how a post-al-Assad Syria should be governed. With European diplomats seemingly giving up on the SNC as a force with the potential to serve as an interim government in the event of al-Assad’s fall, the United States, Europe, and Arab states appear to be searching for viable alternatives. 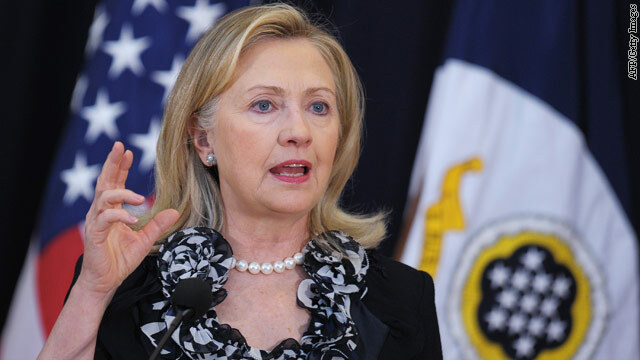 Clinton’s Legacy: Libya or Syria? Editor’s note: Mark Palmer is a member of the board of Freedom House. Paul Wolfowitz is a visiting scholar at the American Enterprise Institute, a conservative think tank, and a former U.S. deputy secretary of defense under President George W. Bush. The views expressed are solely those of the authors. The recent elections in Libya were an emotion-filled celebration of the Libyan people’s thirst for self-government after four decades of extreme tyranny. Admittedly, those elections are only a first step on what will be a long road. And they weren't perfect, but then neither was the NATO military intervention that made those elections possible. Nonetheless, those elections wouldn’t have happened without that NATO action, which in turn would have been impossible without U.S. support, hesitant and halfhearted though it was. Secretary of State Hillary Clinton can take some quiet satisfaction in the elections, since she was a leading advocate of U.S. military action within the Obama administration, reportedly taking on her very powerful Pentagon colleague, Secretary of Defense Robert Gates. 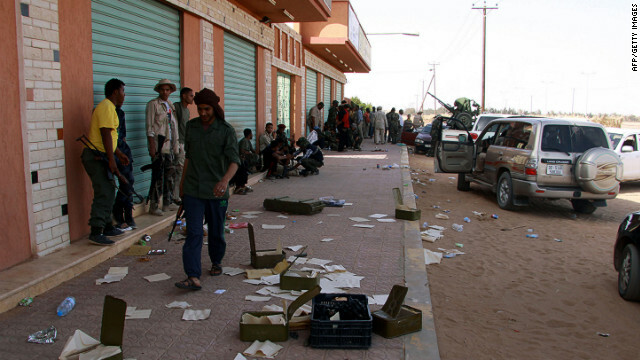 Clashes between the Toubou tribe and Arab tribesmen broke out in Sabha, Libya, in March. Mohamed Eljarh is a UK-based Libyan academic researcher and political/social development activist. He is from the city of Tobruk in Eastern Libya. Follow on Twitter: @Eljarh. The opinions expressed in this commentary are solely those of Mohamed Eljarh. In less than 40 days, Libya is set to witness the first elections since the ouster of the late Moammar Gahdafi. But are the elections coming too early? Post-conflict elections should mark the pinnacle point in the recovery and reconstruction of Libya. Libyans and the international community look at the election on June 19 as a milestone toward peace and democracy. Editor's Note: Isobel Coleman is a Senior Fellow for U.S. Foreign Policy, Director of the Civil Society, Markets, and Democracy Initiative. This blog post is reprinted with the permission of the Council on Foreign Relations. Libya’s emergence from years of dictatorship is predictably a rocky one. The country is moving toward its first post-Gadhafi national elections next month, but the process is marked by considerable confusion and deep disagreements. On Tuesday, Libyan candidates and voters began registering for June elections for a constituent assembly that will be tasked with writing a new constitution. However, a recent law restricting political parties has sparked some bewilderment. Editor's Note: Barak Barfi is a research fellow at the New America Foundation. You can read more from Barak Barfi at Project Syndicate and be sure to check it out on Facebook and Twitter. Although Libyans are now celebrating the first anniversary of the revolution that toppled Moammar Gadhafi, they are increasingly frustrated with their new leaders. Libyans complain that the interim government, known as the National Transitional Council (NTC), has not moved quickly enough to purge and prosecute senior Gadhafi officials, or to rein in the militias that overthrew his regime.